I already know that in seven months when I look back at all of the live performances I saw in 2012, Tina Howe's Painting Churches at the Keen Company will be at the top of my favorites list. Tina Howe is one of my favorite playwrights and as soon as I heard that a new production of this wonderful play Painting Churches was being produced, I knew I had to see it, regardless of who was in it. But fortunately, I didn't have to worry about the casting - the brilliant Kathleen Chalfant is playing the matriarch Fanny Church. Matching her brilliance, John Cunningham plays Gardner Church. 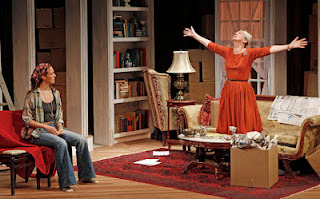 Their daughter is played by Kate Turnbull, who holds her own. 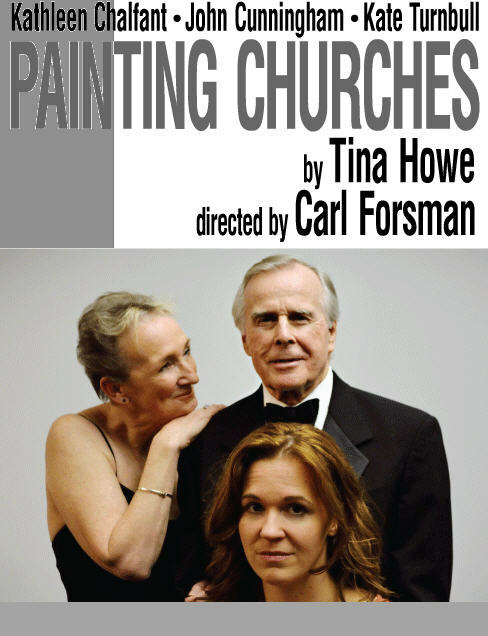 Painting Churches is about an aging couple - she's a Boston socialite, who is trying to hold life together, and he's an erudite poet scholar, who is ungracefully slipping into dementia. They are leaving their large Boston home out of necessity. Their daughter, a portrait painter and art teacher, has come home to help with the packing and to meet her personal goal of painting their portrait. The daughter, who visits her parents rarely, is unable to accept the changes in her parents and their circumstances. It's a poignant story that is told with much wisdom and wit. This efficient and beatuiful production is directed by Carl Forsman. The set is designed by Beowulf Boritt. 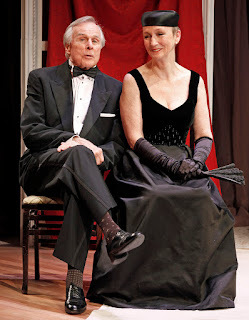 Especially imporant, costumes are by Jennifer Paar. She does a great job of dressing the eccentric socialite Fanny who has succumbed to shopping in thrift stores out of need, both monetarily and to occupy herself. Kathleen Chalfant was everything I wanted her to be and then some as Fanny. She is at once hysterical and heartbreaking. She quietly draws you in and then lowers the boom as she fights to move on and open her daughter's eyes to the truth. She is no-nonsense yet nonsensical and whimsical. John Cunningham plays Gardner with much dignity, but also with complete abandonment when it calls for Gardner to slip out of his own right mind. I was thrilled to see both of these actors live, as I had only previously experience them on Law and Order. I wondered at the effect that this story had on this mostly elderly matinee audience. There was much laughter and applause and I couldn't help but think that perhaps they saw the truth behind the pain of aging and dementia. The Keen Company's Painting Churches is at The Clurman, on the lower level of Theater Row on 42nd Street between 9th and 10th Avenues. Tickets are available via Telecharge at 212-239-6200 or online. It runs through April 7th.